Benton Hall, home to Colgate’s Center for Career Services, the Office of National Fellowships and Scholarships, and Thought Into Action, was designed from day one with sustainable construction methods, materials, and long-term energy conservation in mind. The U.S. Green Building Council certifies buildings at four levels: silver, gold, and platinum. 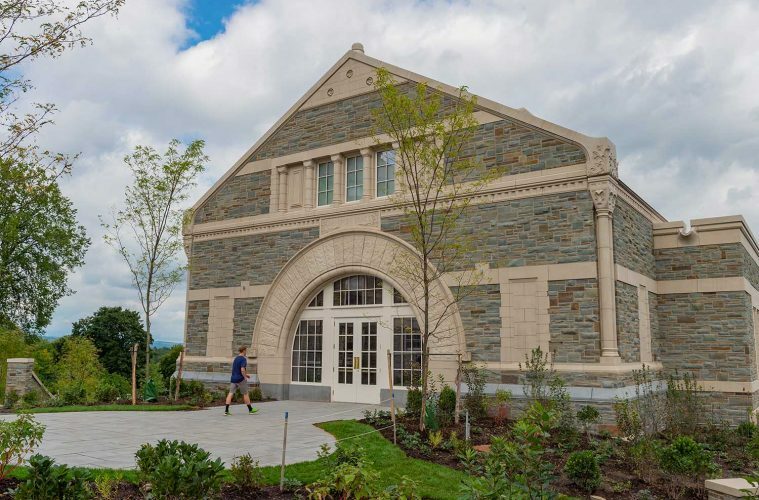 Since opening the LEED Gold Trudy Fitness Center in 2011, Colgate committed to green building practices for all new construction and major renovations, with a minimum goal of LEED Silver certification. In 2017, the Class of 1965 Arena earned LEED Gold. Named after Colgate trustee and lead donor Daniel C. Benton ’80, P’10, H’10, Benton Hall was built with 75 percent of its construction waste recycled or salvaged. Stone was sourced within a 500-mile radius, and a passive house design was utilized to help reduce energy consumption by almost half in comparison to traditional designs. In addition, efficient plumbing fixtures conserve drinking water, and high-performing windows and lighting reduce energy usage, as do vacancy occupancy sensors and daylight responsive light dimming. Of the possible 110 points on the LEED certification scale, Benton Hall attempted 80, and was awarded every single one. For Teresa Olsen, assistant vice president and director of career services, Benton Hall’s environmental enhancements, and considerations have a significant impact on day-to-day life in the bustling building.